- Publisher Wilf Hildebrandt carefully explores the meaning of "the Spirit" in the Old Testament. He examines the role of God's Spirit in creation, in the establishment and preservation of God's people, in prophecy, and in Israel's leadership. He unveils the central role that the Spirit plays in creatively bringing about the directives of God. Through the Spirit, God brings order out of chaos, ushers the invisible into reality, makes a separation between the sacred and the profane, enables specific people to meet particular needs, and supersedes natural laws. This work sheds light on the Spirit of God in both the Old Testament and the New Testament. - Publisher Wilf Hildebrandt carefully explores the meaning of the Spirit in the Old Testament. He examines the role of God s Spirit in creation, in the establishment and preservation of God s people, in prophecy, and in Israel s leadership. He unveils the central role that the Spirit plays in creatively bringing about the directives of God. Through the Spirit, God brings order out of chaos, ushers the invisible into reality, makes a separation between the sacred and the profane, enables specific people to meet particular needs, and supersedes natural laws. This work sheds light on the Spirit of God in both the Old Testament and the New Testament. 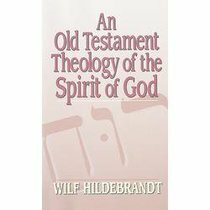 About "An Old Testament Theology of the Spirit of God"
Wilf Hildebrandt carefully explores the meaning of "the Spirit" in the Old Testament. He examines the role of God's Spirit in creation, in the establishment and preservation of God's people, in prophecy, and in Israel's leadership. He unveils the central role that the Spirit plays in creatively bringing about the directives of God. Through the Spirit, God brings order out of chaos, ushers the invisible into reality, makes a separation between the sacred and the profane, enables specific people to meet particular needs, and supersedes natural laws. This work sheds light on the Spirit of God in both the Old Testament and the New Testament. Wilf Hildebrandt carefully explores the meaning of the Spirit in the Old Testament. He examines the role of God s Spirit in creation, in the establishment and preservation of God s people, in prophecy, and in Israel s leadership. He unveils the central role that the Spirit plays in creatively bringing about the directives of God. Through the Spirit, God brings order out of chaos, ushers the invisible into reality, makes a separation between the sacred and the profane, enables specific people to meet particular needs, and supersedes natural laws. This work sheds light on the Spirit of God in both the Old Testament and the New Testament. Wilf Hildebrandt is the Principal of Pan Africa Christian College in Nairobi, Kenya.